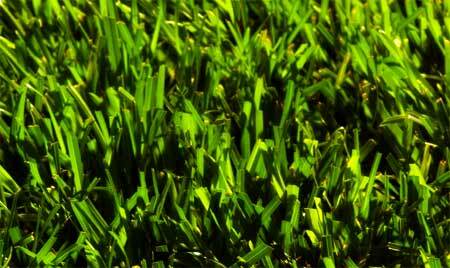 Thermal Blue is adapted to regions where Kentucky Bluegrass and Tall Fescue are grown. Scotts recently introduced a new bluegrass / fescue blend that is supposed to survive even south of the transition zone. It's called Thermal Blue, but homeowners should be aware that it is definitely a cool-season grass. Thermal Blue combines the heat tolerance of turf-type tall fescue with the exceptional turf qualities of a hybrid bluegrass (HB-129). Not only does Thermal Blue stand up to moderate summer temperatures extremely well, it shows outstanding shade hardiness. However, it is only intended to grow where you would normally expect to grow normal bluegrass. While claims to be able to grow south of the transition zone, it should be understood, that doesn't mean very far south of that zone. Thermal Blue is is resistant to brown patch and other diseases, and its aggressive rhizome development gives it remarkable wear tolerance. With a fine leave texture and four-season color in the southern regions, the grass produces a beautiful appearance as good or better than any other warm-season variety. Independent testing during the summer at Auburn University showed that Thermal Blue excelled at locations where bluegrasses traditionally don't perform well—under any circumstance. The research demonstrated that the new Heat-Tolerant Thermal Blue seed produced the best density and turf quality of all the cool season grasses tested, even tall fescue. Care should be taken at claims such as this. Just because a grass out-performed other grasses in such a test, doesn't mean it would out-perform a warm-season grass grown in the same location. 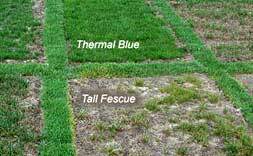 Thermal Blue, featured in New Heat-Tolerant Blue also outperformed tall fescue when exposed to other summer challenges, including growing well in the shade and a higher resistance to brown patch. Other university studies, from Ohio State University to Kansas State University, had similar results in tests showing Thermal Blue’s ability to germinate, withstand heat and disease and establish a thick root system. Scotts claims that Thermal Blue is recommended for lawns as far south as Dallas and northern Georgia.